I recently discovered a new witnessing tactic. Don’t get me wrong, quoting from Spencer W. Kimball’s book The Miracle of Forgiveness has been used by Christian apologists for quite some time. But instead of just quoting this book, I decided to try to give it away, which has proven to be a very powerful tactic. Mankind has the ability to perfect himself and become an omniscient and omnipotent God (p. 2). 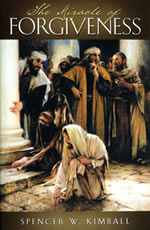 No one can repent on a cross, in prison, or in custody (p. 167). Forgiveness is cancelled on reversion to sin (p. 169). Discontinuance of sin must be permanent (p. 176). Keeping God’s commandments brings forgiveness (p. 201). Salvation by grace alone was originated by Satan (p. 206). Only by living all of the commandments can a Mormon be sure he or she is forgiven (p. 208). Personal perfection is an achievable goal (p. 209). The time to become perfect is now, in this mortality (p. 210). Forgiveness could take “centuries” and is granted based on a Mormon’s humility, sincerity, works, and attitudes (p. 325). The repentance which merits forgiveness requires the transgressor to reach the point where the very desire or urge to sin is “cleared out of his life” (pp. 354-355). Attaining “forgiveness” according to Mormonism requires plenty of effort on one’s part. Those who say that Kimball’s book is no longer authoritative because the author is deceased should understand that Apostle Richard G. Scott called this a “masterly work” in a 2004 General Conference message in his encouragement to have his listeners to “study” it. Seventy Bruce H. Hafen claimed the book “reviews many sins of both commission and omission. And while forgiveness is a miracle, it is not won without penitent and strenuous effort” (Liahona, April 1997, p. 41). In my mind, I thought a dozen copies would only last only three or four hours. After all, who could resist a complimentary copy of a $20 book? All I asked is that the person 1) didn’t already own a copy; 2 was willing to read the book; 3) would agree to email me after reading it. We learned plenty during the first day of our experiment. First of all, offering a free LDS book that most Mormons recognize threw many for a loop. While some smirked, others had a look of disbelief, apparently wondering why I was giving away their book. 70%: Responded by completely ignoring me and the offer. These folks acted as if I didn’t exist, walking by without saying a word. Many of them heard what I said, though there was typically little reaction. 20%: Responded by saying “No thank you” to my offer. 30%: “No, I’m not…but I’m trying.” Isn’t it amazing how many think that doing one’s best is what Kimball taught should be done? I responded that Kimball did not allow for such a possibility on page 164. Under the section “Trying is not sufficient,” Kimball wrote, “Nor is repentance complete when one merely tries to abandon sin. . . . To ‘try’ is weak. To ‘do the best I can’ is not strong. We must always do better than we can.” If there was time, I explained that Kimball did not allow for such an excuse because a person is either keeping or not keeping the commandments. Like being pregnant, there is no in-between position. To “try” is nothing more than an admission of failure. Some Mormons reacted with shock that we were able to quote the book so easily, while others were visibly frustrated. Few had pertinent comebacks to offer. 20%: Yes, I am.” This was a higher number than I expected. While some were sarcastic, others were not. One elderly gentleman confidently told me he was doing it “103%.” I quickly asked his wife who was walking next to him if this were true. She only smiled, then kept walking and offered no rebuttal. Her answer was obvious. Bottom line, nobody can do what Kimball says must be done to attain forgiveness. Several told me that I just need to keep reading the book to the end because Kimball explains the “miracle” part of forgiveness. My response? “Here’s the book, show me the page numbers to prove your point.” Nobody ever came back to explain the very difficult passages found throughout the book. This has proven to be a great tactic. After offering the book to literally thousands of Latter-day Saints over a twelve-day period, I gave away just over forty copies. While many Latter-day Saints walking by may have already owned it, I think that there were others whose pride would not allow them to accept a gift of a Mormon book from someone who does not belong to their church. This entry was posted in Forgiveness, Friendship, Interaction, and Evangelism, Repentance, Salvation and tagged Church of Jesus Christ of Latter-day Saints, Miracle of Forgiveness, Mormons, Ogden Temple, Spencer W. Kimball, Temple outreach. Bookmark the permalink. You forget one important thing that I have to keep reminding myself of when it comes to these faithful LDS folks, this is their system we are talking about, not Christianity. In order to become a god, this is what the LDS are told. They MUST EARN IT! The miracle is that any of them think that they can actually do it. All I can say is that the author of the book had a magic LDS garment that was way too tight. Can you imagine that anyone would take this nonsense seriously? But it makes perfect logic to a faithful TBM. No one gets to be a “god” without reaching sinless perfection, right? What a way to control people. That’s what this is all about. The faithful cult member is under the thumb of the leadership that sets expectations for them that they don’t keep themselves. ………………and for the guy who said he was keeping the rules outlined in the book. What pride! But that is what a system like this leads to. Either it’s constant fear and guilt for falling short or total pride for thinking that it is being attained. Here’s the good news for LDS folks slaving away trying to over-come all sorts of sinful proclivities and the curse of “The Fall” which is our flesh. What Kimball is saying is just his opinion. You can take it or leave it, right? In another thread on this site, we are told that the LDS members are being advised that their prophets and leaders aren’t always up-to-speed or revealing information correctly. I’m all for good conduct. But it’s good to know that the whole point of Jesus dying was because God knew I would slip-up. We have been declared righteous on the basis of our applying the Blood of the Lamb to the door post of our lives. So some faithful LDS person will read this and recall that he/she has been taught that Christians believe they can sin with impunity because of the grace that God has extended to believers. Well I’m sure blowing it if that’s the case because I reject all sorts of sinful opportunities that come roaming through the vast caverns of my mind. I haven’t gotten the memo that says I can indulge the desires of my flesh because I’ve received Jesus as my Lord and Savior. Just think of all of the debauchery we could engage in living a licentiousness and hedonistic life style if what Mormons say about Christians were true. Here’s a better way for folks battling the flesh like most of us do in one way or another. The Bible says to walk by the Spirit and you will not carry-out the desires of the flesh. No teeth gritting here. How in the world does anyone expect that they will over-come the sinful desires of the flesh with their own flesh? He who knew no sin became sin for us. Through the shedding of His blood, Jesus condemned sin in the flesh. He drove a stake through the heart of our flesh. We don’t war against the flesh with our flesh. We war against the flesh by the Spirit of God who is the Father’s Gift to the Church. So is this really what Mormons believe? Again it’s probably this guy’s opinion. But notice something important. It’s exactly the opposite of what the Bible reveals to us. That ought to give Mormons pause. The Bible tells us that there is One God. That’s it. Nothing in the Scriptures to contradict this. Well this is real bad news for the thief on the cross who Jesus told that he’d be with our Lord in Paradise that day. What could Jesus have been thinking? The Blood of Christ continually cleanses us from unrighteousness. I write this to you that you might not sin but if you do sin we have an Advocate with the Father, Jesus Christ the Righteous. A just man falls seven times. The Blood of the Cross of Jesus Christ brings forgiveness for all who accept His sacrifice as total payment for their sins. Yea but the Bible teaches us that it is God’s grace extended to us the means of our salvation. I’m glad the “can a Mormon” is inserted here because Christians follow the Bible which tells us the means of our salvation. Sorry, laudable goal but you’re setting yourself up for failure. Well what about Mormons who are going to get the work done after death? WOW! That’s a long time for a Mormon to wait. I received forgiveness over forty years ago and it only took a couple of minutes. Actually I was granted it the day Jesus died for me. It took me a little while to catch up with it. Good luck folks. That would mean that your entire flesh had done a 180. Isn’t going to happen. Fantastic article, Eric! I loved how you gathered the responses to your book giveaway. And I very much appreciate that you care enough about the LDS people to do this outreach, to say nothing of this ministry. Martin Luther once spoke of God’s law as being: A mirror, a hammer, and a whip. It is a mirror as it reveals how sinful we human beings are. It is a hammer, demolishing the illusion that one is good; that one is righteous. It is a whip, driving the sinner to the Cross. For it is at the Cross that Another was found guilty and judged in the sinner’s place. If one believes this “most difficult” book and is honest with oneself, this book can only bring despair. For it brings the heavy weight of God’s law to the reader, places the reader under it, and offers absolutely no solution to the condemnation under which the reader stands. To me, it is no different than sending a copy of an indictment to a person sitting on death row. The copy of the indictment is rendered in calligraphy, under glass, within a golden frame. A formal statement of the condemned one’s guilt. No miracle in that. And no hope. Perhaps this “most difficult” book would be more properly titled, The Hopeless Gospel. Maybe that sounds harsh. And maybe this subject would feel more academic if I did not have family members and friends who are lost and mislead by this fundamentally dishonest institution. But that is not the case. This is Mormonism. It’s a cult (with my apologies to our sensitive lurkers). The Mormon god is a task master who expects and demands perfection. Given what this book says, I would classify the Mormon heavenly father as an unrelenting, demanding autocrat. So when Mormons speak in hushed reverential tones about “heavenly father”, do they understand who the Mormon leadership say this false god is? This is Mormon/LDS law. It isn’t even the Law as in OT Law. The Law that was given to Moses. The Mormon/LDS law is a different breed of cat. It has nothing to do with God as He is revealed in the Bible. It certainly isn’t Christianity as revealed by the Lord Jesus Christ and practiced by the first century Church and taught by the Bible. There’s no Jesus in any of it. What we have in the LDS sect is a hybrid version of a lot of religious speculation and Free Masonry rituals and a Holiness Movement on steroids. You’re right about the speculation which is more appropriately entitled false “revelation”. I take exception to the “Holiness Movement on steroids”, though. If that were true, then Joseph Smith would truly be holy and not have slept with so many women. If it were true, then Joseph would have truly prayed all night and all day and sought to remove alcohol from his life rather than to consume and sell it. And of course, he would have purged the witchcraft rituals, seer stones and other non-Biblically prescribed methods of revelation from the early LDS movement. Oh also, he would have experienced the ‘deep sleep’ experience (John 18:3-8; Genesis 15:12, Daniel 8:18, 10:9) that some of the Holiness Movement encountered. But you are right, the LDS faith is a very wrong caricature of Biblical Christianity. Joseph Smith was influenced by a lot of different religious thinking and speculation that was rampant in the early 19th century. He was influenced by the Methodist. If we look to the teachings of John Wesley. There are all kinds of phonies who preach “holiness” but don’t practice it. I still fail to see Joseph Smith taking the Holiness movement to the extreme/steroids, even if we are to use your definition (which refers to only some denominations of the Holiness movement). Perhaps you’re trying to draw a parallel between the book and the holiness movement’s possibility of being free from all sin? Can you link to the tract you put together? I’m going to keep an eye out for used copies of the book to give to my Mormon friends and it would be cool if I had a handy “study guide” to accompany it. The idea is that Joseph Smith and his boys grabbed ideas from here and there and shaped them to conform with their own peculiar inventive bent. I was speculating that since the Methodist were to a large degree the revivalists of that era, their views on personal morality would have been well known to Smith. I could name other influences such as the Free Masons, Swendenborg and folk magic to name a few. Is this an attempt to say to Mormons that they are to lead sinless lives. I don’t know but it appears to me to be a gross mis-representation of the event. God understands our nature well, right? He knows why it was necessary for Him to die for us. We fall, get up and try again. For those interested, here is a link to the Kimball million dollar bill tract that Eric mentions. You will find it on the MRM website. I checked it out Sharon. Very good. What I can’t figure out is where is the “after all you can do” scenario come in? So you really can’t do what this guy is getting at in his book. Doesn’t seem like much of a miracle to me. It’s a miracle if the LDS member doesn’t go crazy trying to be perfect. Thanks for your comments on my post. They are appreciated. I think I did suggest an equivalence between the law given to Moses and the code of laws described in the LDS prophet’s book, which of course cannot be made. I’m sorry for the confusion. An update to this blog: Randy and I attended General Conference last weekend. We had no idea how this tactic would work. We stood at the corner where many walk by, and within 10 minutes a middle-aged woman came up and asked about the book. This was to the chagrin of those Latter-day Saints who had brought her. When we asked if she was LDS, she said, “No, but I’m about to join.” It was a chance to share the “other side.” Five minutes later, she had the book (we encouraged her to read it to see if she would ever be able to attain what Kimball said must be done), a DVD, and other info as she continued to “Conference.” She got a quick overview of the gospel as well. She had been a Buddhist for 20 years but it didn’t “fulfill,” she said. Would you believe, between the morning and afternoon sessions, we gave away more than 30 books (a record!) and hundreds of the Kimball tracts–many were DELIGHTED to have them. Of the 30 books, about half couldn’t believe they would get a free copy, especially when they knew we were not LDS. All we asked, I said, is they had to promise to read it. Every one who received a copy made the bargain and most agreed they would check out what we had to say about it at http://www.themiracleofforgiveness.com. This strategy has proven to be a great tool and will continue to be used (with the methods continually perfected, forgive the pun) in upcoming outreaches. What better way to evangelize than use an LDS book still sold at Deseret Books? We are brainstorming for additional outreaches. Thanks for your financial support in helping us produce this bill and purchasing additional copies of the book. And P.S. Randy went DI’ing (Deseret Industry shopping) last weekend and purchased 40+ additional copies of the books in one afternoon for a few bucks each. Until the last Latter-day Saint understands how impossible this gospel really is! I’d be interested if there will be any push-back from the LDS church or if you’re efforts will remain under the radar screen. They are famous for shutting things down if there’s even a ripple of success by Christian outreach workers. This week, I spoke with LDS Missionaries and asked them to read specific portions from the MoF. One of them simply would not look at me after reading about the Lord will indeed forgive but he will not tolerate repetitions of the sin. Shortly thereafter, they admitted that they were missionaries and not aware of all that needs to be aware. One LDS Member after hearing that portion being read, told me that he subscribes to Prophet Monson, that Prophet Kimball was the Prophet at his time, and a living prophet means more to him that a former prophet. Yea they like to pull out that version of the LDS escape clause. So as I understand it, the LDS prophet is just for the particular era in which he lives. After his death a whole new Mormonism is developed based on the new prophet. Is that about right? When coupled with the “it was just his opinion” Mormonism can be made to be true for the fervent and pliable true believer. This is the mind of the faithful member of a control group also known as a cult. The member is asked to suspend credulity and believe in unicorns. The problem facing these folks is what is eligible to be thrown out? Polygamy, blacks in the priesthood, the introduction to the BoM, the BoM itself with all of its changes, the temple ceremony which was said to be a little to graphic for female sensibilities and on and on we go. I didn’t even mention BY’s Adam-God doctrine. This MoF is beyond legalism. But it defines the LDS religion. The religion certainly isn’t based on the Bible or the traditions of the Christian faith. It’s not a reflection of the Gospel preached by Jesus’ disciples or Jesus Himself. Some restoration, huh? It’s not based on anything that actually was practiced or believed by the NT first century church. I wonder where these looney tune prophets of the LDS church come up with this stuff. And why do the people accept it? ………………………..and then there’s is “progressive revelation”. This is the really fun part of Mormonism. This is when the Mormon god gives sort of a “breaking news” update to the Mormon prophet. Mormonism in this way is always a work in progress. Some past leaders have even claimed that the Mormon god doesn’t know it all and he is progressing in more knowledge and wisdom. So there are, I suppose, some gods in the Mormon pantheon that are of higher rank than others. Anyway, the Mormon god could come along at any given time and say that Mormon baptism and paying your tithe is all that is necessary to become a god. The Mormon god could say that the BoM is a spiritual book and not an actual history of an actual people and events. The Mormon god could say that the “restoration” by Joseph Smith was for just a “season” because of blah blah blah, whatever. And now the LDS doctrine will be based on the writings of L. Ron Hubbard. So this MoF teachings could be flipped very easily. Look what happened to Bruce McConkie’s book “Mormon Doctrine”. Think of all those Mormons who fell on every word written by Bruce in this “definitive” work. Now they won’t even publish it. apostasy and then spiritual death ! [ Conf Report Oct 1947 , p. 67 Harold B. Lee ] . sadly people have fallen for it because of clever salesmanship . Great work Eric and Randy . We all pray for a harvest of souls for Jesus ! Are the LDS members taught the concepts that are in the MoF or is the book a sort of outlier? When they go to their church sponsored educational programs is this what is presented? I’m curious as to whether or not Mormons look at this as doctrine or simply something to accept or reject on a personal level? It certainly has nothing to do with Christianity and appears to have emerged as Joseph Smith and those who immediately followed him, developed his man-to-god idea. I can see why those raised in Mormonism LDS form, can’t wrap their minds around the Biblical doctrine of sin and forgiveness. What Christianity teaches is not meant to be complicated or difficult. I think that’s what trips up Mormons. They’ve got this other god with a different gospel that is based on personal works-righteousness. There’s two levels to their salvation program. One is general and covers anyone who has ever lived. The other one is personal where by the individual LDS member believes that he/she must be in tune with the LDS religious system and work to earn the payoff. And Mormons want to be considered Christians? Thanks for that quote, I’ll use it. Unfortunately, in the minds of poor LD Saints, these unicorns do exist, for they bear their testimony. I’m wondering if there isn’t a brag factor here with Mormons. That is, because the LDS church teaches this very high level of sinless perfection, do Mormons now think that they have a superior religion? They don’t have to actually keep it, just repeat it, as in talking about what it is they believe regarding sin and forgiveness. Maybe they sort of live vicariously through the teaching. Mormons do enjoy a public persona of being neat, clean, orderly, moral, devout, sincere, dedicated to family…………………..on the outside at least. But then there’s those nagging statistics that plague Mormons especially in areas that they heavily populate. FAIR Mormon will say that there is no proven connection, of course, between the high level use of depressants in Utah and membership in the LDS religion. In fact, they’ll say, that LDS woman report higher levels of happiness. Now why would that be? If someone asks an LDS woman if she’s happy, what will she say? If someone takes to heart the precepts in MoF and is really trying and, of course failing as can be predicted, will they still report being “happy”. I suppose it’s possible for someone to live under such an oppressive level of control and legalized religious structure and still be “happy”. Perhaps claiming the “happy” label is what is expected. After all, how could someone not believe in the restored gospel and the LDS life style not be “happy”. I always find it interesting that the first thing out of the mouth of many former Mormons is something like, “I was very happy as a Mormon.” The statement is certainly an attention grabber because the expectation is that they were miserable and hated being a Mormon and that’s why they left. Micah Wilder talks about being so gung ho on his mission that one Sunday night he and his partner walked into a Baptist church with the expectation that they would convert the pastor and the entire congregation. The pastor listened politely to them and then, as Micah puts it, “He destroyed everything I ever believed in.” The pastor encouraged Micah to read the NT as a child would read it. In the year that followed Micah found that the gospel he believed and the church he was happy in, was false. Mitz Nelson was also “happy” living in the restored gospel. Fourth generation Mormon. All hoping, wishing and praying to end up in the Celestial Kingdom. She had the returned missionary and the priesthood holder, the forever family, the whole deal. So what happened? So how could someone be “happy” in Mormonism and then leave? Well the point is that they weren’t happy when they left. There were, excuse me, dumb/ignorant/unaware, then something happened. And no, they didn’t leave because someone offended them or because they had fallen into serious sin. Most of the time they started to discover things about the history of the Mormon religion, the founding prophet and/or finding out the truth about the restored gospel. I could make a long list of the discoveries but that’s easy to obtain if a questioning Mormon starts to look. But the point of the article of our thread here is the stark difference between the gospel of the LDS church and that of orthodox Christianity. The point of the Gospel of Jesus Christ is that we are sinners separated from God. God in His mercy, love and benevolence made restitution for our sins by His sacrifice on the Cross. Those of us who put our trust and confidence in the Lord Jesus Christ are saved by faith. We lead a transformed life as led by the Holy Spirit who indwells believers. We still have moral lapses, called sin, but the Blood of Christ continually cleanses us from all unrighteousness. The natural inclination of our flesh is to sin. But as we walk in the Spirit and not in the flesh, we move from justification to sanctification. The bad news about the MoF philosophy is that it sets up an impossible scenario where by a person can never experience peace with God. I can’t imagine what type of image of God is conjured up in the mind of a Mormon who takes the MoF message as truth. I think in some sports, the participant is often given consideration or more points for “difficulty” of the dive, the routine or the exercise. The idea is that if someone’s routine is more of a challenge than the competitors, that should be taken into consideration in scoring. It’s the same now days in assigning class rank for high school valedictorian. Some courses are deemed to be more demanding and therefore are assigned more points. That doesn’t apply to religion in terms of gaining salvation. God does not assign difficulty points in determining who is saved and who isn’t. Jesus is the only one who gets the credit for completing a most difficult assignment. He became sin for us. That’s what the Bible says. He who knew no sin became sin for us. Mormons have assigned to themselves an impossible task. No matter what they do within their religious system, it will never be enough. The false system of LDS style Mormonism thinks it can deem certain members the status of having done enough. The system decides who’s worthy and who is not; in this sense. Isn’t that something that God decides? There is no “one true church”. There is nothing anyone can do to reach sinless perfection. Not only is that an unrealistic goal, it’s not even possible. I think I’m a pretty moral guy and I sin in thought, word and deed everyday. Thankfully I don’t have to battle any of the big stuff that some people struggle with but sin is sin. If we commit one sin we are guilty of violating the whole Law. So as Christians, we don’t depend on our own efforts to get or stay saved. We depend wholly on the Lord Jesus Christ and give no credit to anything we might “do” favorably in the flesh. That clearly separates Mormon apostles from the true ones who preached the true gospel . claims of Jesus’ true apostles and thus deceive many with their counterfeit gospel . Gal. 1:8 was penned to aid us in exposing latter days false religious leaders . Mormon leaders pedal a counterfeit gospel . Where can I get the details of Micah Wilder’s interaction with that pastor? You can go to you tube. There are several videos of his Christian testimony along with his mother Lynn and dad Michael. Here’s one with Micah.